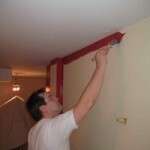 Edging a wall takes practice but with a few helpful tips, you’ll be an expert in no time. Dark and contrasting paint colors are the more difficult because any imperfection stands out. 1. Get a good paintbrush! That’s right, if you’re improvising yourself as a painter, you can only hope to get acceptable results if you use the proper tools! Too often I have seen people buying a $6 paintbrush from the hardware store… Enough! If you’re doing it yourself, do yourself a favor, go out to A PAINT STORE and buy a real brush! The best ones are ANGULAR-shaped PURDY paintbrushes. All good painters will conquer that they’re really super good. Try and see. Expect to pay from $20 to $30 for a good paintbrush. Bétonel, Benjamin Moore and others hold this professional paintbrush. The addition of this water or liquid will modify the viscosity of the paint to increase the smoothness, and this will help the all-natural glide of your brush. Now, since your brush is gliding more easily and faster, you just need to work on your confidence and body mechanics. Tape is generally used by amateurs and it shows. In order to cut straight lines, one should count more on himself and on his or her eyes. What the tape typically does is make a bridge for the liquid paint to cross-over onto the door knob, ceiling, trim or wall. When you look at it from 5 feet away, the lines still look terrible. If you look at your result from close up, you’ll see a checkered effect that is similar to the teeth of a saw. That’s it! Now that you know the basics, go ahead and experiment! And please, drop in a public comment below to let me know if this worked for you or if you have a tip you’d like to share! If you would like more details, I’ll answer here too. Thanks!